Beef bourguignon or bœuf bourguignon, also called beef Burgundy and boeuf à la bourguignonne, is a well known traditional French recipe. It is a stew prepared with beef braised in red wine, traditionally red Burgundy, and beef broth, generally flavoured with garlic, onions, carrots, a bouquet garni, and garnished with pearl onions and mushrooms. Traditionally the meat was larded with lardons, but modern beef is sufficiently tender and well marbled that this very time-consuming technique is rarely used anymore. However, bacon cut into small cubes is still used to produce the initial cooking fat and added to the dish at the end. 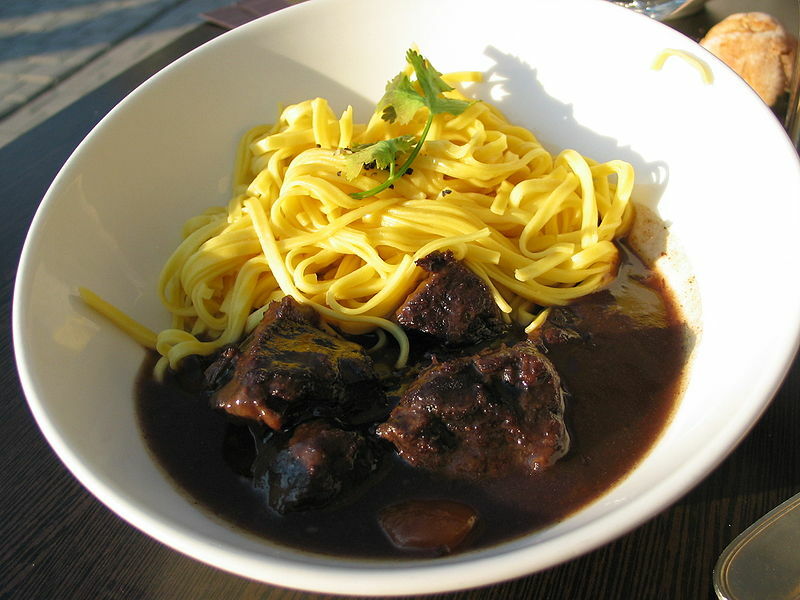 Beef bourguignon is one of many examples of peasant dishes being slowly refined into haute cuisine. Most likely the particular method of slowly simmering the beef in wine originated as a means of tenderizing cuts of meat that would have been too tough to cook any other way. The slow cooking and simmering in the wine tenderized the meat, while keeping the meat flavor in the dish. Over time, the dish became a standard of French cuisine. Preparing the dish begins with cutting bacon into lardons and frying them in butter (in the southern regions of France, olive oil is often used). The bacon is then removed, but the fat retained in the pan. Chopped onions and carrots are then added and slowly cooked (not browned). At this point, the meat is added, the heat raised, and the meat is browned. Following the browning, the bacon is returned to the pan, and two to three tablespoons of flour are sprinkled over the meat and vegetables. The pan is then shaken to coat the meat and vegetables with the flour, and put into a very hot oven, for about ten minutes, so as to bake the flour into a coating on the meat. At this point, reduced wine and beef stock are added to the pot. There is a common misconception that only wine is used in the preparation. This may have been true with stronger cuts of meat in the past. Today, with good quality beef, a mixture should be used. The wine and broth are added in equal proportions until the contents of the pan are covered. A tablespoon of tomato paste is then added and stirred in, a clove of garlic is pressed into the pan, and a bouquet garni is put into the contents. This is then returned to the oven, with the heat reduced to medium, and cooked for about 1 1/2 to 2 hours. While the beef is cooking, the onions and mushrooms are prepared. The onions, which should be small pearl onions, are peeled, and put in a pan with hot butter to be browned slightly. Beef broth is then added and the onions are braised until completely cooked and well caramelized. Little moisture should remain, but if some does, it should be drained off. The mushrooms should be sautéed just minutes before the beef is done (the beef can even hold while the sautéing is completed). The onions and mushrooms are then added to the beef, and the dish is served in the same casserole in which it was cooked. For a thicker gravy, remove the beef and reduce the braising liquid before adding the onions and mushrooms. If using a roast of beef (chuck steak is an excellent cut for this recipe) instead of cubed stewing beef, it should be sliced.